Guess who is in town? Ty and the gang from Extreme Home Makeover. They picked a family here in Raleigh and began the renovation last Friday. We went down there tonight and got a couple pictures. It was really neat to see the whole production and you really felt for all the neighbors who can’t drive down their street or sleep at night from the noise and lights. It is amazing to see. 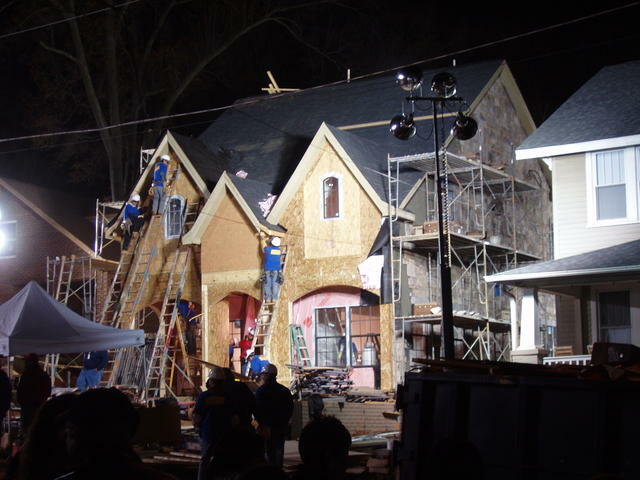 Sure it is just a house being built, but like you have never seen before. We (okay I) was hoping to see Ty, but I knew the probability of seeing him was slim. We were told he was there filming earlier in the day. I guess him and the gang were off enjoying a nice meal somewhere!! It wasn’t like you see on TV. There are tons of trailers and tents everywhere. It must take a lot of work to coordinate everything. I do kinda wonder what the stars are doing all day and night while the volunteers are working!! I have heard several people talk about watching them record and re-record shots. Kinda funny. Well, they are doing a good thing for a good family. Here is a link with some great pictures from each day. I am going on the Oakwood Candlelight Tour this weekend so I will stop by and take a few pictures of the finished house and post. The show will air in February, I will let you all know when I found out the exact date.